After a second round of chao quesadillas, I went back to the store to pick up more of Field Roast’s new and amazing chao cheese for my partner only to find that there was none on the shelves. 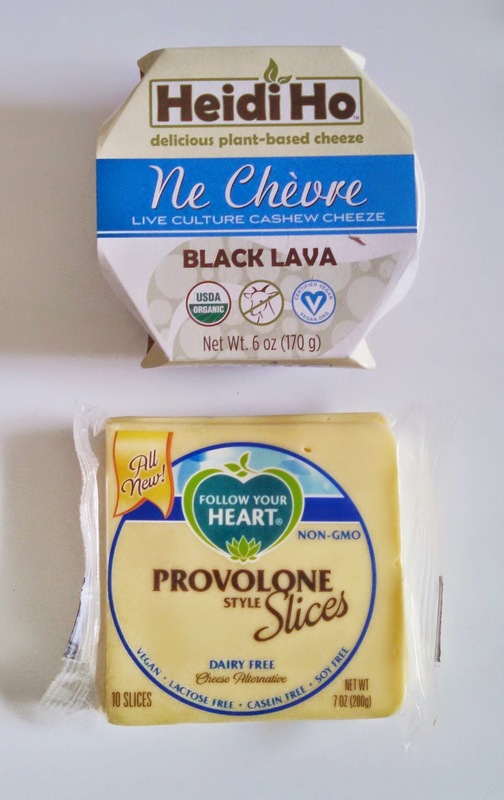 While I was back there, I noticed the new Follow Your Heart cheese that is similarly made with coconut oil and decided to pick that up instead. They were out of many varieties but still had the slices and blocks in a few flavors. Not formerly being anything remotely close to a dairy cheese lover, I couldn’t figure out which flavor to purchase. I picked up the provolone for us to try out since as far as I can remember, I’ve never had vegan provolone. And since I haven’t had dairy cheese in forever, my partner will be my resident tester to determine how provolone-like it really is! Then, I saw something even more exciting. Whole Foods Pittsburgh now carries Heidi Ho Organics cheeses! The company, from Portland, Oregon, has been around for several years, and they have a large fan base out west. I’ve wanted to try their cheeses (like the chia cheeze and the hazelnut-based cheeses), but it’s hard when the shipping costs as much as the product. While doing research for this post, I realized that Heidi Ho had gotten a deal on Shark Tank which I’m sure explains the wider distribution of the product. After seeing the news stories online, I can vaguely remember my mom telling me about that. Cable shows have gotten so strange, but it’s amazing to see vegan companies like Cinnaholic and Heidi Ho reaping the benefits of these new negotiation and competition-like shows. I just picked these up and haven’t yet had a chance to taste them, but you can look forward to a review of both of these cheeses very soon! site and now this time I am browsing this web site and reading very informative content here.